When I walk into a Jo-Ann Fabrics, my nerves tingle and I start salivating. I suddenly, absolutely need to iron a roller-skating dinosaur decal onto a shapeless three dollar t-shirt. I want to crochet a cross-body satchel that will make me look like a geriatric Rastafarian. My hands twitch and I resist the urge to call my accountant and empty my 401k on fiberfill stuffing, an abandoned warehouse and an embroidery machine the size of the Hadron Collider so that I can start my own patio furniture cushion business. I started crafting at a young age. My Mom was great at crafts and taught me to crochet, cross-stitch, sew and macramé a far-out '70s plant hanger. Crafting reminds me of the sweetest days with my mother, when she would quietly sew while I snuggled up to her. The irony is that I absolutely s*ck at crafting. Everything I make looks like a Home Ec /crack-house fusion project. Ripped seams, glue blobs, crooked lines, unraveling yarn diarrhea... But that does absolutely nothing to deter me. As a kid, I knit my Dad a 16-foot long scarf and then wondered why he never wore it. A ceramic tree I painted looked like a melted bong. I sewed clothes for stuffed animals that made them look so much like homeless panhandlers that my brother fashioned them tiny coffee cups with "Jesus Loves You -- Everything Helps" printed on them. When I became a mother, I couldn't wait to craft with my own girls. I thought, I'll be good at crafting now! I take time to read directions! I know how to hold scissors! 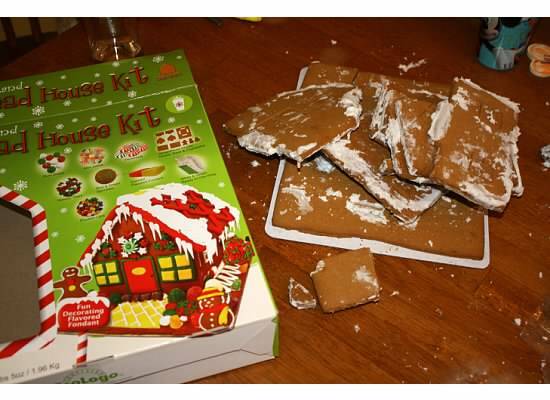 My first brilliant idea was to make one of those fancy gingerbread house kits. I don't know who the heck decided that downy bits of frosting can hold up giant blocks of gingerbread that have the molar mass of plutonium. I didn't even try to adorn it with candy. I let my kids eat the candy and told them it was a Gingerbread Hovel for poor kids, and if they didn't behave Santa would make them live in a house just like it. The wreckage graced our holiday mantel until Three King's Day, when it began teeming with ants. It looks just like the picture! Next, my daughter and I tried to make an Easy Weavy Totebag. The box said "your child can make a sassy little fabric tote bag!" First of all, it's not fabric. It's the kind of flexible plastic you find on cheap lawn chairs. Second, it takes a half hour to pull the strips apart, as they come on one sheet. After my daughter and I nursed our paper cuts, we realized that after you rip the 486 strips apart, they coil up and tangle. We also realized, who the hell wants to weave an imitation-wicker purse? Wicker is the furthest thing from "sassy." After I make these realizations, I promptly forget them. All it takes is three seconds of inhaling the sweet scent of grosgrain ribbon at a craft store and I start fantasizing about having my own show on HGTV. It wasn't long before I discovered transfer paper and decided I needed to decorate all my kids' shirts! I taught myself Keynote and bought a special ironing pad. I pressed a blue bird onto my daughter's shirt, daydreaming about throngs of children begging for my amazing, homemade clothing. When I tried to pick the shirt up, half of the transfer paper ripped off, adhering to my ironing pad and ruining it. I surveyed my work and saw that I'd scorched the paper, so there was a yellowy crust on the shirt. And there was some nasty stain that made the bird look like sh*t was leaking out of its stomach. A few weeks later, I was looking at houzz.com and I saw some shabby chic ottomans. I had an idea! I called my best friend, Melissa. "Remember how I wanted my living room to be all crisp and cream and traditional? Forget that. I'm making it shabby chic. Check this out -- I can just buy some ugly cheap ottomans and sew covers for them!" "Oh, we do upholstery now?" she said sarcastically. "Yup. And there's an awesome website that sells wholesale upholstery fabric." "Why bother?" she said. "Why don't you just buy some sheep and a loom and weave it yourself?" "I don't weave anymore," I told her. "You know that." When my husband found me trying to hack through 40 yards of damask with a pizza cutter, he asked "what's going on in here?" in a concerned voice. "I'm upholstering some ottomans!" I told him. "Do you really think that's a good idea?" he asked skeptically. "Why do you always crap on my ideas?!" I snapped. He sighed. "You're really smart... it's just that... you don't always think things through." "What's there to think about?" I said. "I have fabric. I have a sewing machine. How hard can this be?" There is no way it can go wrong this time.